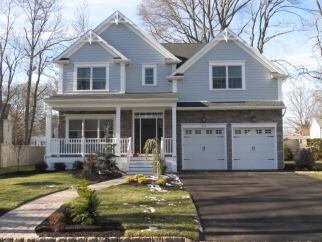 Description: Welcome to the newest Fox & Foxx fabulous new Colonial home in Westfield. Beautifully nestled on a tranquil tree lined winding street with plenty of room for entertaining and back yard fun. - Architecturally grand, with exceptional attention to detail and quality, custom crown moldings and trim and Coffered ceilings in LR, DR and FamRm. Ten room, 4 BR, 4.1 baths with open floor plan, fin bsmt w/full bath, high ceilings, FPLC, 2car garage/front porch. Features include: Maintenance free exterior, hardwood floors, custom kitchen cabinetry with lifetime warranty, stainless steel GE Caf� line appliances, granite countertops w/center island, Master Bedroom with tray ceiling, 2 walk-in closets and spa quality Master Bath. 3 additional BR on 2nd floor, including one with its own bath and additional hall bath.